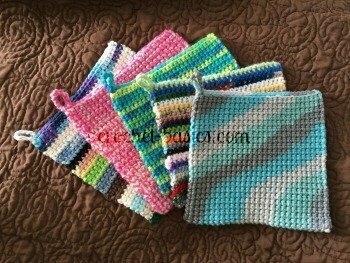 The crochet bean stitch is an awesome stitch to work. It has a fun pattern to it when it’s completed and has a wonderful texture. It feels thick and warm, which I love for scarves and hats. The bean stitch also looks great from both sides of your work, as well and has some stretch to it. So, it really would make an awesome scarf, or a cushy pillow or a warm sweater . . . Do you see where I’m going here? It would be great for any project! 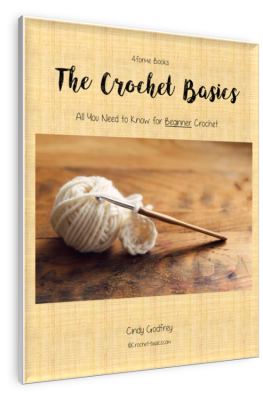 The crochet bean stitch might not be as easy for beginners, however. You will be pulling through 6 loops at a time with this stitch so it will take practice. That shouldn’t deter you, though, if you want to give it a try. It's fun to work and well worth the effort. Just keep in mind, that it might take a little extra practice to get it just right. For this swatch let’s chain 21. Insert the hook into the 3rd chain from the hook and pull up a loop. Yo one more time, insert hook into the same stitch as before and pull up a loop. Yo one last time and pull through all six loops. You can see how the chain 1 pulls the stitch together and completes it. Even though the chain 1 is considered part of the stitch, most patterns will still tell you to chain 1 after it. That doesn't mean you should have 2 chains between your stitches, though. They're basically just reminding you to complete the stitch. Repeat form * to * across. If you look at the top of your stitches, it kind of looks like there are two chains for each bean stitch. One is usually a little smaller than the other. This is actually the top of the bean stitch and the chain 1. The looser/bigger stitch is the top of the bean stitch and the tighter/smaller one is the chain 1. You will be working your next stitches in the stitch to the left, the smaller one, which is the ch-1 space. Repeat Row 2, 8 more times for a total of 10 rows. 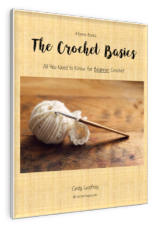 Have fun working the crochet bean stitch and come back and tell me about your projects with the link below!